"41AN38, 88, 1" by Timothy K. Perttula and Robert Z. Selden Jr.
DECORATION: The neck of the vessel is decorated with horizontal and diagonal hatched engraved zones or narrow panels repeated three times around the neck. The body has interlocking horizontal scrolls repeated six times around the vessel, as in the Poynor Engraved, var. B examples from the upper Neches River basin. A red clay pigment has been rubbed in the engraved lines. TYPE: The design elements (especially those on the body) are reminiscent of several unnamed varieties of Poynor Engraved, including what has been called Poynor Engraved, var. B. The vessel form is unique, however. Poynor Engraved, var. 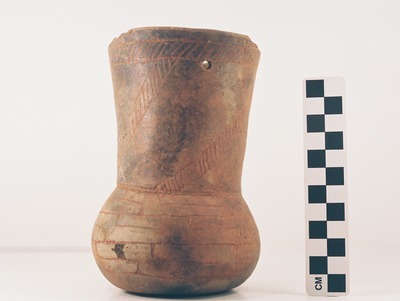 B compound vessel or wide-mouthed bottle from Feature 88 (Vessel 1) at the Lang Pasture site.